Mature Height 6 – 10 ft. Mature Width 3 – 5 ft. 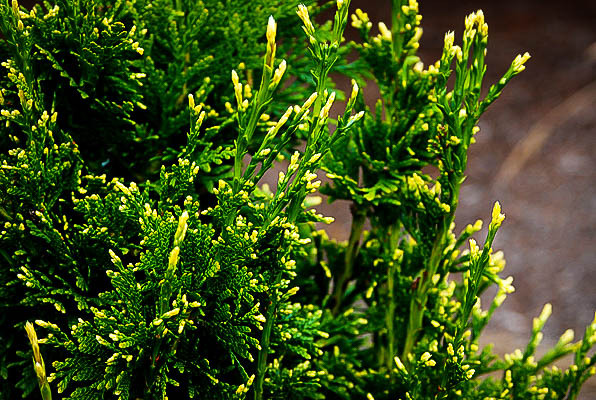 The Thuja Can Can is the perfect small hedge plant. It grows naturally to around 8 feet, and will never outgrow a small space. 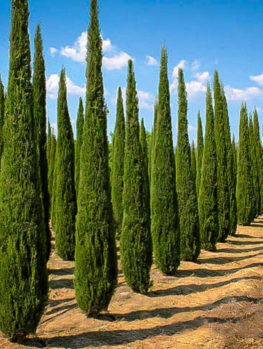 It is ideal for a smaller garden, where other evergreens grow much too large. Now, finally, we have the hedge that stays small, without needing trimming. If you want a super-neat, formal look, simply trim once or twice a year – if you forget, you don’t need to worry. This plant is the perfect, rich green color all year round. The foliage is tight and naturally dense, and the new growing tips are creamy-white, making this a far more interesting plant than a plain-green cedar. The Thuja Can Can grows easily in any garden soil, and it really thrives in those damp places where many other plants will not grow. It grows well in full sun, but it also grows happily in partial shade, so don’t worry if your chosen spot has some overhanging trees or shade from your home – it will still grow well. It is hardy throughout zone 5, and grows in all but the hottest areas too. Not only is it free of pests and diseases, this great tree is usually left completely alone by deer, so it is an ideal hedge anywhere. 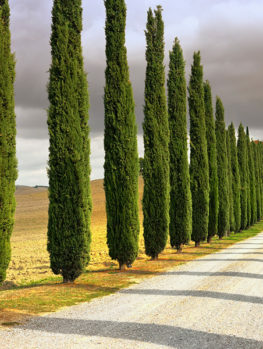 Cedars are usually associated in most people’s minds with hedges and large screens. 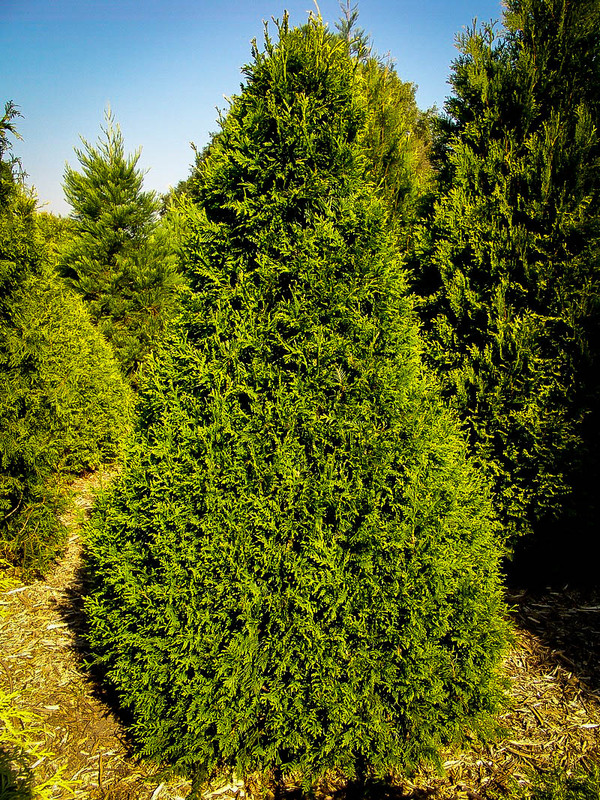 Plants like Thuja Green Giant, Emerald Green Arborvitae, or Leyland Cypress are all types of Cedar Trees, and all grow large, making impressive hedges or screens. In modern gardens, which are often small, these plants are hard to use, and need constant trimming to stop them taking over the whole garden. 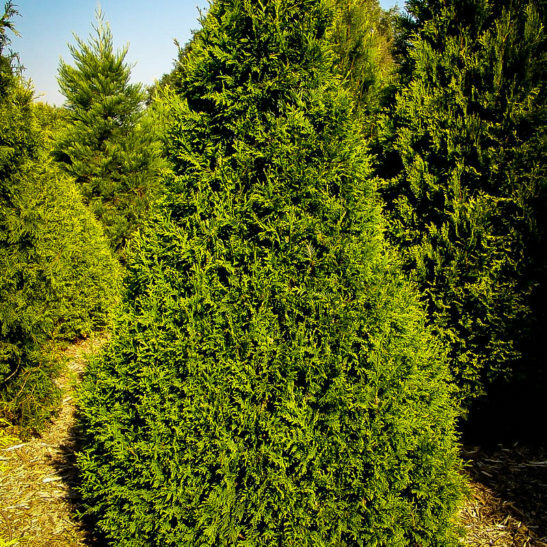 A smaller version of these useful and attractive evergreens is needed, and here it is – the Thuja Can Can. 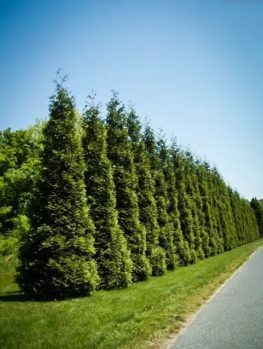 Instead of growing 30 to 50 feet tall, Thuja Can Can grows just 8 to 10 feet tall, and because it grows more slowly, it makes an informal hedge that needs no trimming, or a formal, very neat one with just one or two trims a year. It naturally reaches the perfect height for a hedge in a smaller garden, and will never outgrow the space you have available. It is also pest and disease free, and even deer resistant, so those pesky animals will leave it alone. It grows well in most soils, and it is very suitable for damp or wet locations. Not only does this plant have reliable, rich-green foliage in winter and summer, it never browns in winter. The tips of the stems are creamy-white, giving a bright, sparkling look to this plant. These tips show most on new growth, so after you clip your plants it will be covered in this fascinating feature, which persists all through winter. They brighten your hedge or screen, looking much more attractive than the usual dark green color of evergreens. 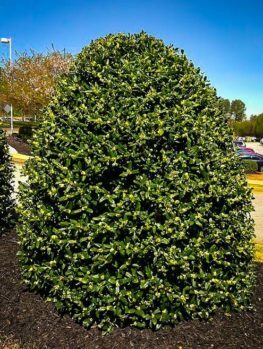 Besides hedges, this attractive upright evergreen tree also makes a great, easy-care specimen for a bed, or paired on either side of an entrance. Because it is small, it can even be grown for years and years in a large pot or planter, and looks wonderful on a terrace or patio. In a larger garden, this is the ideal plant to screen your swimming pool or hot tub. 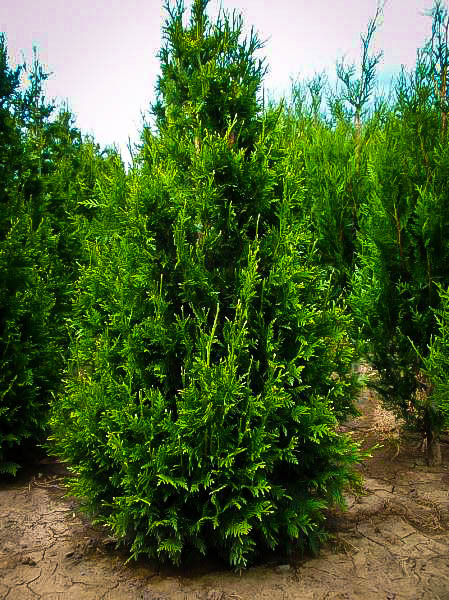 Wherever you need a reliable, smaller evergreen plant that needs no work, then the Thuja Can Can is your number one choice. The Thuja Can Can naturally forms an attractive, broad evergreen, reaching 8 feet tall in about 10 years, and 3 to 5 feet wide. 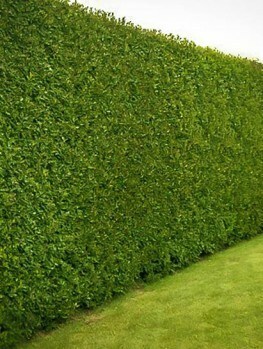 Because it is wide, you only need to plant 4 feet apart to make a dense hedge, so you do not need many plants for a long hedge around your property. Its attractive broad form also makes it a great plant to fill corners of the garden with a plant that needs no care, and will never grow too large. This plant grows well in any ordinary garden soil, and thrives even in damp to wet soils where many other plants will not grow. It grows well in full sun or partial shade, unlike many other evergreens, which will not grow in shadier spots in your garden. It is also free of significant pests and diseases, and best of all, it is normally not eaten by deer. The Western Red Cedar (Thuja plicata) is a relative of white cedar, as well as other Arborvitae and Thuja plants from around the world. Western Red Cedar grows naturally in Oregon, Washington state, and in Canada. It grows into a large tree, well over 100 feet tall, with some ancient specimens approaching 200 feet. This is a tough plant that will grow in wet soils, and shadier places, and it is widely grown around the world. 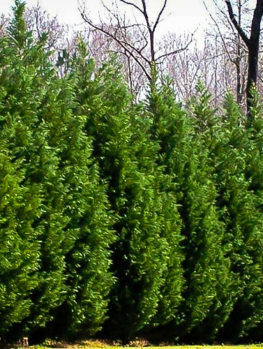 It is also one of the parents of the famous Thuja Green Giant, known for its rapid growth and a favorite for large hedges. The Thuja Can Can has been specially selected to have all the good properties of Western Red Cedar, but to remain small, making it ideal for smaller spaces and smaller gardens. It was found at Blue Mountain Nurseries, in the far south of the islands of New Zealand, and brought to America about 20 years ago. The Thuja Can Can is a very desirable plant, and so hard to find. After considerable searching to make this great plant available to our customers, we have found a top-quality supplier of plants derived directly from the original parent plant. These plants have all the desirable properties – low height, dense, rich-green foliage, and those attractive white tips – and are completely unlike the wild tree, which is far too large for most gardens. 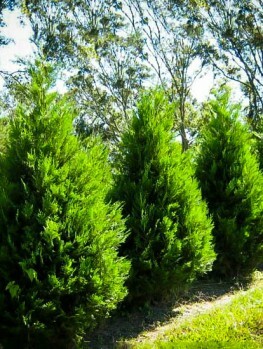 Do not be fooled into buying cheaper plants just called ‘Red Cedar’, as these will grow enormous, completely unlike the wonderful dwarf Thuja Can Can. This tree is a top-quality smaller evergreen, and it is ideal for smaller gardens as a hedge that only needs an occasional trimming. We know how high the demand is for this new plant, and we have a good supply. However, these plants sell fast, so if you have a smaller garden, and want a hedge, or an attractive specimen evergreen, then order now to avoid the disappointment of seeing the ‘sold out’ sign when you come back to our site.